IMPORTANT NOTE: Model 284 Fork Mount Hook is NOT a drum lifter. It is just the fork-mounted hook from which to suspend a drum lifter or other device. 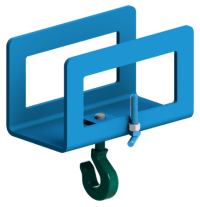 This fork mounted hook slides right onto the fork of your truck to enable use of any Morse below hook drum lifter with your forklift. 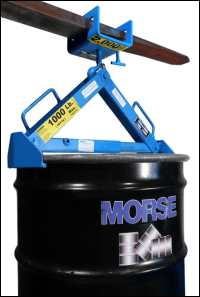 Turn your forklift into a 55-gallon (210 liter) drum hoist. 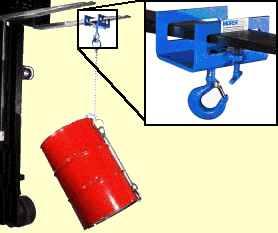 Model 284 Fork Hook is shown above on fork, being used in combination with model 42 Heavy-Duty Drum Lifter. 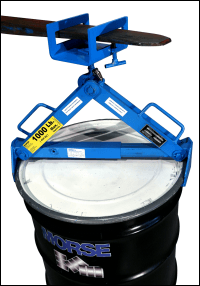 NOTE: Model 284 Fork Hook is NOT a drum lifter. 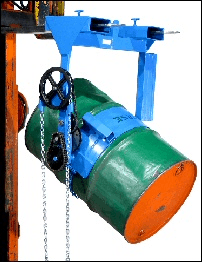 It is jus the fork-mounted hook from which to suspend a drum lifter or other device. 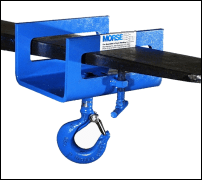 284 Fork Mount Hook 5.5" X 1-9/16" (14 x 4 cm) 2,000 Lb. (907 kg) 11 Lb. (5 kg) L9.5" W9.5" H9"
284L Fork Mount Hook with Larger Opening W8.5" x H3.69" (21.6 x 9.37cm) 2,000 Lb. (907 kg) 17 Lb. (8 kg) L10" x W10" x H10"
Morse model 284 Fork Hook used to suspend a drum lifter or other device below a fork.